We would like to take this opportunity to apologise for this recent lack of information, and hopefully this should all soon start to be rectified, first of all with an update to the season's calendar, and then with the publishing of entry forms for the first tournament of our 2017/2018 season, the 38th Northamptonshire Junior Chess Congress, which is due to take place on Saturday 4th November at Wellingborough School. Entry forms for this tournament will soon be sent out to all players on our database, and will also be available to download here shortly. Well done to both Toby and Ben Cox. At this year's National Junior Squad Championships which took place earlier this month both of them won grading prizes within their sections. For Toby this meant qualification to join the National Squad, where he joins his brother Ben who also achieved the same feat earlier this year at the South of England Championships. The NSCA would like to congratulate both Ben and Toby on their wonderful successes, and wish them both all the best for the matches that the future has in store. Although we are unable to find all the detailed results from the Junior Squad Championships, a written report can be viewed by scrolling down on the NCJS home page, which can be found here. It has been a very busy few weeks for our chess teams, with a match of some sort going on most weekends of late. This started very promisingly with the journey up to Nottingham for the 2017 Midlands Championships, with us sending 4 teams - an under 9 team, two under 11 teams, and a girls team. The under 9s had a fantastic day, winning the competition outright scoring 22 out of 24. The girls team finished a very creditable third. With the under 11 teams we split the teams evenly, but one of the teams still managed to finish theird in that section none the less. We hoped that this may point to promising results in the EPSCA qualifying competitions, but sadly for the under 9s and under 11s this was not to be. Unfortunately a number of players were unable to make these matches, and in both competitions they finished 7th out of 8 teams, and hence failing to qualify for the finals this year. The girls team travelled down to Twickenham to play in the national final, along with 14 other county teams, and unfortunately also found the going very tough, finishing in equal 14th place with Hertfordshire. Links to all the scores for all the counties can be found on the EPSCA competitions results page here. The Rockingham (Northants and Leicestershire) Meagfinal takes place in Wellingborough on May 13th. Secondary age children no longer need to pre-qualify, but as normal Primary School children need to qualify for the Megafinal via internal competitions within their schools or chess clubs. However, we have become aware that a number of schools are not running qualifying competitions this year, and so we have set up a "Last Chance Saloon" which will take place at St. Peter's Independent School in Northampton on April 22nd. Via this tournament the top boy and top girl player in each age group (under 7, under 8, under 9, under 10 and under 11) along with any player scoring 4 or more points, will then also qualify for the Megafinal in May. We hope this will help a number of players, and you can download an entry form with all the full details here. We had a fantastic turn out for this year's Junior County Championships, and many thanks to Wellingborough School for allowing us to use their facilities again - the school lay out serves us really well. All the county champions were decided, and photos of some of the best performing players can be viewed here, whilst all the final scores from all the sections can be viewed here. Well done to all the players that attended, and an updated list of the top players in this season's NSCA Grand Prix can also now be seen here. We would like to encourage you to support our colleagues over the border in Leicestershire who will be holding a Junior Congress on Sunday 5th March. This is a junior six round swiss rapidplay chess competition (all players play in all rounds) in two sections (Open and Minor) open to all entrants U18. The Minor section will be ungraded and is for inexperienced players or players graded below ECF 40. It's ideally suited to those new to competitive tournament chess. There will be awards for 1st, 2nd, 3rd and Best Girl and for the best Leicestershire & Rutland qualified player in the U11 and U9s. Instruction will be given in how to use a chess clock to those new to it. You can download full information here, meanwhile entry is online, and can be done here. Although a number of these players are just from "out of county", as they are very much part of the Northamptonshire chess family we would like to congratulate the following players who made the journey down to Yateley Manor in Surrey to take part in this year's South of England Junior Championships. In the under 8 section Sarthak Sanyal gave a very good account of himself scoring 4.5 out of 6 and finishing joint 5th out of 51 players! In the under 9 section Lucian Cox scored 3 out of 6, with his brother Ben Cox scoring 2.5 out of 5 in the under 14 closed section, along with Max Miller who scored 1.5. Well done to all these players, and all the scores and cross tables for all sections can be viewed on the dedicated website here. The Northants Junior County Chess Championships will take place at Wellingborough School on Saturday 18th February, and you can now download an entry form here. The 13th Christmas Congress took place between Christmas and the New Year at St Peter's Independent School in Northampton, to whom we are very grateful for the use of their facilities enabling us to hold this annual tournament again. We had a reasonable turn out of around 55 players and all the scores from all the sections can be seen here. This also formed the second part of the NSCA Grand Prix, and updates of the leaders in this season long competition can be found here. These prestigious championships take place before and during the festive season, and a number of local players made the journey down to the UNiversity of Westminster in Harrow to take part. Lucian Cox played in the Under 10 Major section and also the Under 12 Minor section, scoring 3.5 out of 7 and 4 out of 9 respectively. Meanwhile, both of Lucian's brothers were also in attendance, with Toby Cox scoring 3.5 out of 9 in the Under 12 Major section, and Ben Cox scoring 2 out of 6 in the Under 14 Major. Ben was joined in that section by Max Miller, who finished with 3 out of 6. All the scores from all the sections can be found via the LJCC website here. At Saturday's England U11 Trial Qualifier, Alexander Dytrych scored 3/5 and Lucian Cox scored 2/5. Alexander's performance earned him a "half-norm" for the England U11 squad (Two half-norms are required to be invited into the England squad trial). On Sunday it was the U16 British Rapdiplay Championship, in which Alexander scored 1/5 and Lucian scored 1.5/5. Meanwhile, other members played in the adult Minor Championship (Under 121). Toby Cox and Ben Raine came joint 3rd with a score of 7.5/11 and also collected the grading prize. Ben Cox scored 6.5/11. All three also earned a half-norm for the England Junior sqaud. Many congratulations to all these players on some wonderful results. There are a number of different toiurnaments during the season through which you can try and qualify to play for England. You can read all bout them on the EPSCA website here. For all the scores from the Rapidplay Championships you can look at the dedicated tournament website here. Our first competition of the season took place on 5th November with the 37th Northants Junior Congress being played at Wellingborough School. It was a very well attended tournament with over 100 players taking part across the three sections. All the scores can be viewed here, whilst you can view photographs of many of the top players from the day here. Many congratulations to a number of players who recently took part in various sections of the J4NCL (Junior Four Nations Chess League) at an event on 1st - 2nd October at Wokefield Park, Reading. 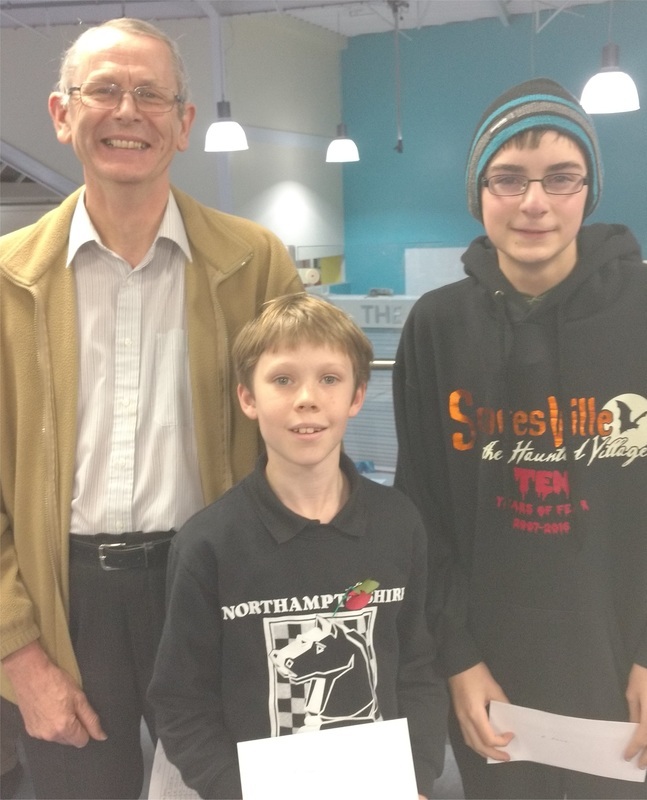 A Northampton Junior Chess Club team of Toby Cox, Ben Raine, Ben Cox, Ivan Petkov, and Lucian Cox came 1st (from 18 teams) in Division 2, scoring 8/10. Meanwhile, Max Miller and David Collyer played for the "Leicester Blues" team, coming 3rd in Division 2 with 7/10, and Milly Kotecha won the best girls' team in Division 2 with "Dragon Princesses". Well done to all these players, and a link to the full results can be found here. If you would like to find out more about the Northampton Junior Chess Club you can find full details on their website here. A team representing Northants played recently in the under 14 section of the NYCA championships, which took place recently at Malcolm Arnold Academy in Northampton. With some very tough opposition in attendance the Northants team finished a very creditable 4th out of 9 teams, with Samir Sheikh receiving the team prize for his performance. The final scores can be viewed here. 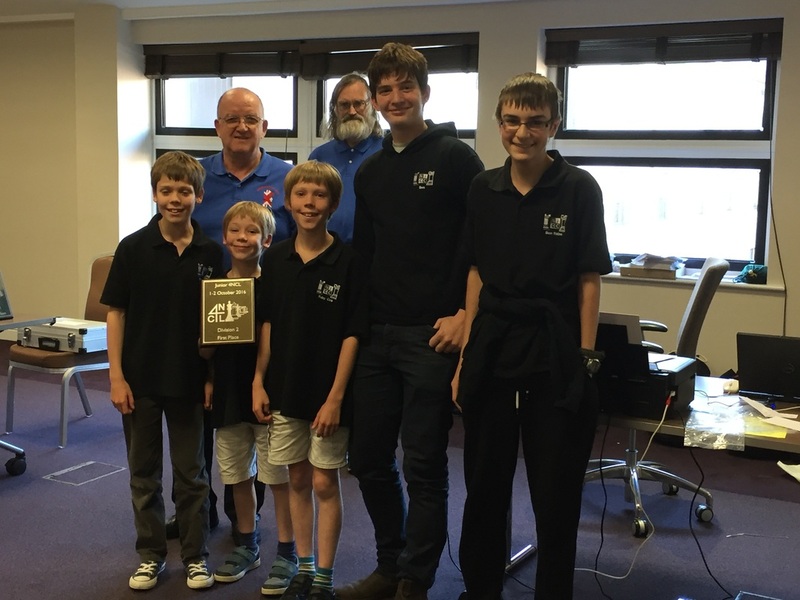 During the summer break a number of junior players took part in the UK Chess Challenge Terafinal in Loughborough and the British Chess Championhips which took place in Bournemouth. The terafinal has a different points scoring system to that usually used, but in various Challengers sections Milly Kotecha scored a very respectable 10 points, whilst Emily Rowe, Briony Tomkins and Zak Gillespie all scored 6 points, and Luca Gillespie scored 3. Meanwhile, with the conventional scoring system in place at the British Championships Max Miller achieved 3 wins from 7 games in the under 13 section. However one Northants junior, Sam Herring, was playing in the Major Open section of the Championships, and finished in joint 8th place out of 39 players scoring 6 points from his 11 games. Well done to all these players on a superb summer. For further details, you can find all the Terafinal scores here, and all the British Championship scores here. Yes, for a number of reasons after a rather longer than usual summer break, here we go again with another chess season to take us into the dark winter months and then back out to the longer summer days of 2017. The new season kicks off properly on 5th November with the Northamptonshire Junior Congress taking place at Wellingborough School, and an entry form can now be found here.